If you possess conceit you have excessive self-pride, and thus think too highly of your own abilities. Ida Showman’s narcissism or self-centered vanity knew no bounds. She constantly thought about and adored herself; to this end, her house was full of mirrors so that she could gaze at her reflection in narcissistic, self-loving bliss. Every conversation she had with others was narcissistic, or centered solely on herself. In her narcissism or excessive self-love, Ida purchased a present for herself every day; she was, after all, the very best, and deserved it more than anyone in the whole world. Quiz: Try again! 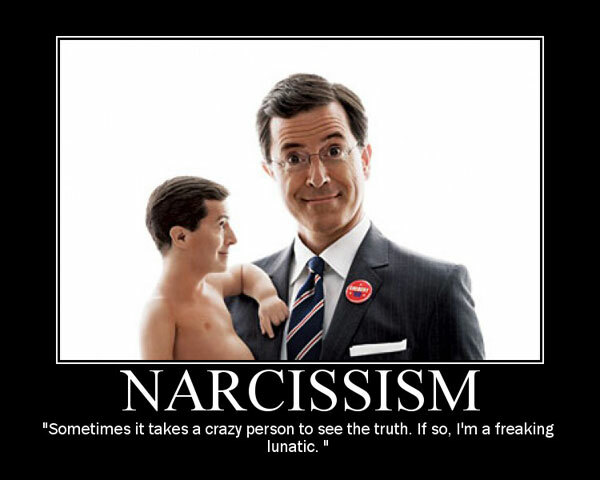 When is someone narcissistic? When that person is unaware of others’ needs. When that person is consumed with self-admiration. When that person is absolutely beautiful. Narcotic Kiss Her narcissism was so bad that she would blissfully kiss herself in the mirror in such a way that it produced a narcotic or pain-killing, pleasurable effect; hence did narcissism eventually do her in--she just couldn't bear to leave that mirror to eat or sleep. Narcissism comes through “Narcissus,” a character in Greek mythology who fell madly in love with himself, lulling himself into a “numbness” or “deadness” of extreme self-absorption. After Narcissus died, he was transformed into the narcissus flower, some varieties of which contain chemicals that induce sleep. An Echo of Narcissus This story from Greek mythology tells of a narcissistic young man who was cursed to love only himself, and excessively at that.